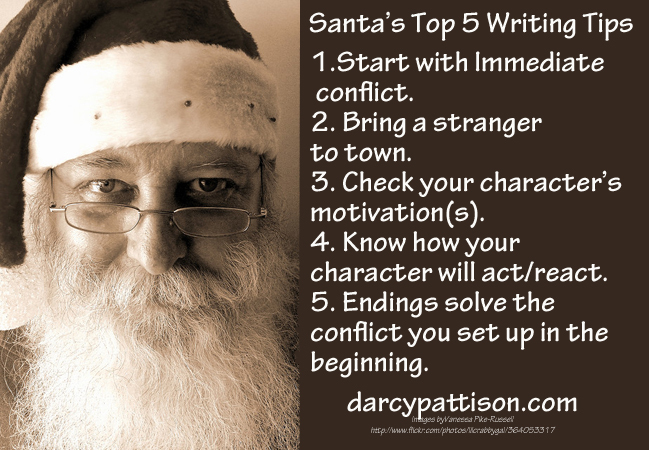 Just got an e-newsletter from the North Pole and Santa had these writing tips posted for the young-at-heart who are writing novels this year. Stay tuned: Santa promised to send me writing tips based on “The 12 Days of Christmas” tomorrow. These tips from Santa Claus are based on the song, Santa Claus Is Coming To Town. Instant Conflict. When you open a story, make sure it has instant conflict. Here, the characters are crying and pouting. Plots. A Stranger comes to town. It is said that there are only two plots in the world: a character leaves home, or a stranger comes to town. This time it’s promised that the stranger will bring happiness and joy. But will he? Character Motivations. Are you checking your character’s motivations? You should know who is naughty or nice and especially why. No character should be totally one or the other. Soften villains and round out main characters by giving them a flaw. Know your characters. You should know your character’s feelings, actions, morals. When s/he is admonished to be good, what would s/he do? Endings. Make sure the story’s ending resolves the conflict you set up. Here, the song doesn’t resolve the conflict, so we have an unsettled feeling. Well, that’s probably OK. Christmas morning will tell the real tale. And it’s OK to leave the reader wanting a little bit more, as long as you resolve the inner conflict and leave the reader with hope.